Frank Alderson (Service No 1703) was born in Woonona, NSW. At enlistment Frank was single, 19 years old, worked as a carpenter, and had served in 37th Infantry Militia. He embarked with his brother Henry (Service No 1702) on HMAT A9 Shropshire with 4th Reinforcements, 13 Battalion on 17th March 1915 and arrived at Gallipoli in May 1915. Frank was evacuated to hospital in Malta sick with influenza on 21st August 1915. He was sent on to England on 27th September 1915. 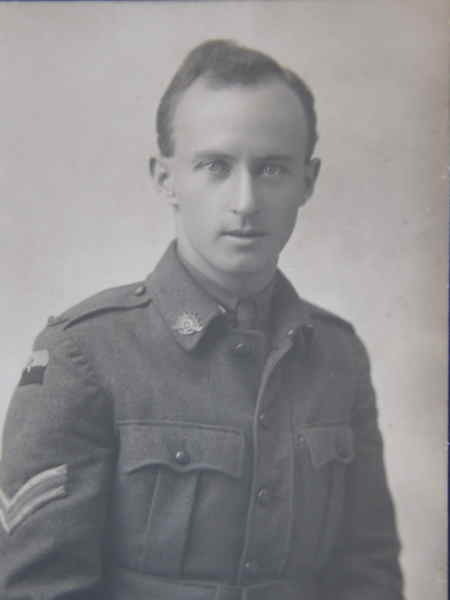 Frank rejoined the battalion in Egypt on 4th March 1916 was sent to France and saw service on the Western Front. He was promoted to Lance Corporal in France on 3rd September 1916 and then to Corporal on 9th December 1916. On 19th January 1917 he was again sent to hospital sick but re-joined his unit in France on 29th April 1917. Frank was wounded in action on 8th June 1917. He was evacuated to hospital for treatment of a serious injury to his right hand and lost three fingers. He was returned to Australia in November 1917 and discharged medically unfit on 6th March 1918. On 10th November 1919 he married Edna Earle at Armidale, NSW, and the couple had 3 children. In 1929 Frank was in hospital being treated for his hand wound when he died from blood poisoning. He is buried in Rookwood Cemetery in Sydney. Frank and Henry's younger brother Charles Stanley aka Harold Palser (Service No 2955) also served.